Maddi - Welcome back fans of The 100. With only a few minutes we get to see what we'll be facing this season with our first look at the brand new fourth season of The 100. M - Last season ended with A.L.I.E admitting that the remaining nuclear plants on the planet that weren't destroyed by the bombs are beginning to melt down and that soon 96% of the world will be uninhabitable. 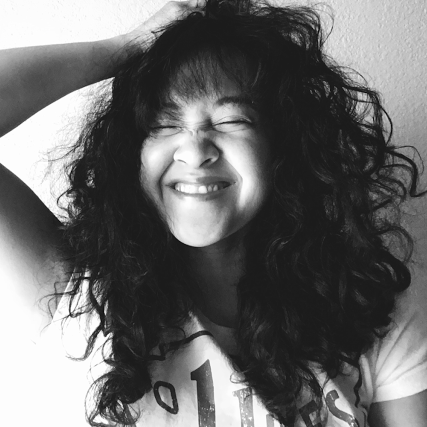 Kristy - The first thing we hear is that familiar voice we all know so well from last season. Did anyone else get chills hearing A.L.I.E's voice again? M - "Black rain will come first. There will be no drinkable water." K - Okay, that first shot of someone literally melting! Then the black rain, and who was that in the hazmat suit? Bellamy? Wherever he is going, it can't be anywhere good. M - "Precancerous lesions will form." K - Then we see Murphy inside some sort of tube container.. Is this back at Arkadia or have they discovered some place new? M - At that time we did not know if A.L.I.E was just saying this to stop Clarke from pulling the lever and shutting her down forever, or if in fact, she was actually telling the truth. M - She was, as we see powerful radiation sweep across the land, destroying anything and anyone in its path. Black rain falls from the heavens. People withering away, suffering terribly from the effects of the radiation, and the many piles of wrapped bodies on the floor. K - The trailer cuts to show those dead bodies being prepared for the ritual burning at Arkadia. I can't help but wonder what the cause of all these deaths is? From the things A.L.I.E had warned Clarke of? Or an attack from Azgeda? Or something else? If we know anything from past trailers, just because a certain scene is paired with a voiceover, that doesn't necessarily mean that the two go along together in an episode. M - We were worried about who wouldn't survive last season, but this is just the tip of the iceberg. There's literally no saying who won't or who will survive this season. K - "We can save the human race together." "You don't ease pain, you overcome it." M - It looks like Raven has gotten herself into some trouble as we hear her screaming "run" as she tries to flee from her chasers with gunshots following closely behind. We don't know exactly what's happening here but the one thing we do know is that only the Sky People have guns. Does this mean her hunters are her own people? K - It is her own people? It looked like someone was hunting them, using their own equipment to do so.. We also get a glimpse of Miller among this group who is running with Raven before we see her getting shot at alone. So what is happening? Who could be chasing them? M - "If we stick together we won't just survive, we'll thrive." Clarke tries to rally her people to yet again fight for survival. M - Roan is seen leading an army and nearby Clarke stands before them among their path, now carved in by rocks, which I'm sure she had something to do with. Does this tell us the army is, in fact, marching on Arkadia? If it is, it looks like the fight between the Grounders and the Sky People is still not yet over. K - Which is so crazy to me! I think someone had said that this season will take place immediately after the events of last season, so I'm curious to see how the aftermath went down between the Grounders and the Sky People. Did Clarke share the information that A.L.I.E told her with everyone? If she did, why wouldn't they join forces to figure out a way to survive this? Maybe they don't believe her though and they want to continue to gain the most power amongst all the people, very much like last season. 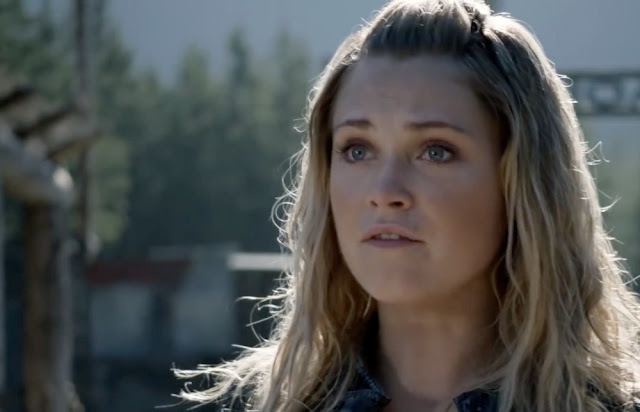 M - Monty confronts Clarke's intentions. "You're the one going too far. Using the same justification; that it's all for my people." "It is," Clarke defends. Clarke is always trying to save everyone by any means and sometimes choices are made and lines can be crossed. So is that line once again going to be blurred with Clarke willing to do almost anything to save her people? M - "We save who we can save today. I am not sacrificing any more innocent lives." Bellamy is finally back to the man we know he can be. He did what he thought was right last season following Pike and ended up massacring hundreds of Grounders. Not only is he back but he's also grown, now understanding that all lives are worth saving and he's committed to saving as many as he can. K - Yes! I'm so happy that Bellamy is back to who I always knew he was and I'm excited to see his journey this season. Also, can we all just appreciate that the delinquents seem to be together in most of these scenes shown? I know I'm not alone when I say I enjoy the show more when all of them are together, surviving as a team. They've always balanced each other out, and I'm looking forward to what they are able to do together this season. M - For a second there we may have seen a glance of Luna who looks to be on the brink of death. We know she's the only remaining Nightblood. Will the complete history of Commanders be lost forever? K - I noticed Luna also, and I'm looking forward to seeing more of her this season. I'm not sure what kind of role she will play? Maybe she'll be willing to work with Clarke and unite the Grounders and Sky People though. M - This season is not just going to be a continuing fight against the Grounders, but even more so amongst themselves and their own people as they are all pushed to the very edge. K - There are so many shots we get; Bellamy pointing a gun at a Grounder showing that they are not currently on the same side and of course there will always be Jaha. "Decisions we face just wither you down, piece by piece," he says as they cut to someone screaming in what looks to be a new village we'll be seeing this season. M - Roan is seen fighting against someone. Is Roan fighting for his crown? And we see Kane fighting not only for his life but somebody else's against his own people, "I will shoot the next person who touches this man." Who is he defending? Could it be Bellamy or somebody else? K - Does this confirm our thoughts of the Sky People being split yet again this season? M - "We can't kill our own people." "I'm trying to save them." K - Kane is just on the list of people that are all going to be having a hard time recovering from what happened last season. We know how badly A.L.I.E broke him and used him. The only question is will he be using his pain to fuel his vengeance in a good way or will it lead him down a dark path? M - "Justice and vengeance are not the same thing." Octavia's road continues to darken ahead as she goes down a path she may not be able to return from. Bellamy tried to save his sister from going to the place where he was lost, but Octavia made her choice to kill Pike and it looks like it's just the beginning for her. "They're calling her Sky Reaper. Death from above." K - Wow! I'm not surprised by what we see from Octavia in the trailer especially after she killed Pike. I knew where her path was leading her and it was nowhere good, no matter if she got justice for Lincoln's death or not. She has completely alienated herself from the people who love her, and I'm curious if she'll find her way back to them in the end. M - A woman is seen promising Roan, king of Azgeda, "I can help you do what your mother never could, what Ontari never could." "Rule everything," he responds. Roan's never been one for conquering the world. He's actually one of the few Grounders to work with the Sky People. They're somewhat allies. What could change his mind to turn against them? K - That woman looked like Echo to me? Maybe I missed something and she died last season, though? I don't really remember, but it did look like her. If it was her, that could not be good given how she's always been manipulative, in my opinion. M - Murphy is seen confronting Clarke. Murphy is sometimes the only one who says what needs to be said to Clarke. "Maybe you're forgetting the last time you were trying to save us, I was saving you." K - I have grown to love and appreciate Murphy, like Maddi said he is the only one who is completely honest and blunt with Clarke when she's clearly making horrible decisions. She, in turn, listens to him and takes his words to heart unlike when we saw her talking to Monty. M - "I'm not forgetting," Clarke responds. This looks to be just another sign that Clarke may once again be leading them the wrong way, and they're headed straight for trouble. K - Does anyone else notice that this place they are at looks different than anywhere we've ever seen? It does not look like Arkadia or a Grounder village.. So where are they? M - One of the most talked about scenes of the trailer, the Bellarke moment. M - Bellamy's seen confronting Clarke, tenderly reaching to place a hand on her shoulder, and Clarke reaches back holding on tight before asking him, "You still have hope?" "We're still breathing," Bellamy reassures her. Bellarke, always stronger together. K - Yes, Clarke I still have hope in my ship. I know all of us Bellarke shippers were extremely happy about this scene in the trailer! Of course, I loved seeing them growing so close to one another, still being there for each other, but I just loved Bellamy's character in this moment. Isn't Clarke usually the one who talks him into having hope, believing in the best outcome? And yet, here Bellamy is the one with hope still, telling her to believe. Wow, what a transformation from who he was last season. 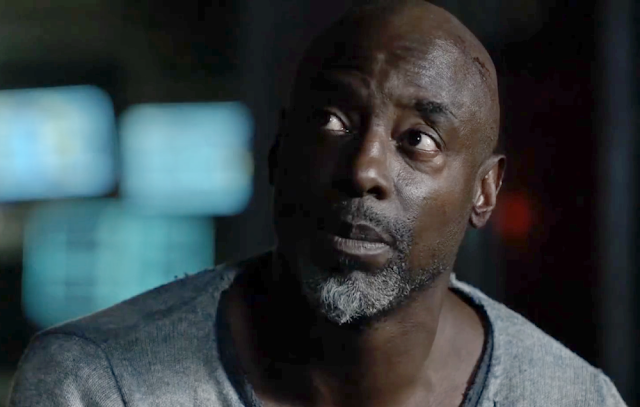 M - With a montage of quick flashes we see Jaha is still around. "You have to give them something to fight for. People need to feel like that have a say in their fate." 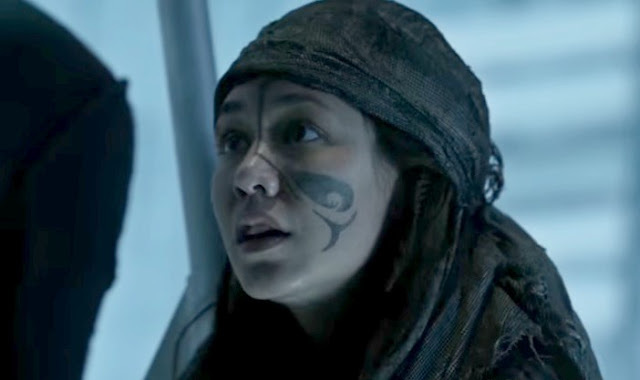 K - We also see that Octavia is wearing war paint on her face?! What could this mean? Who is she going to war with? 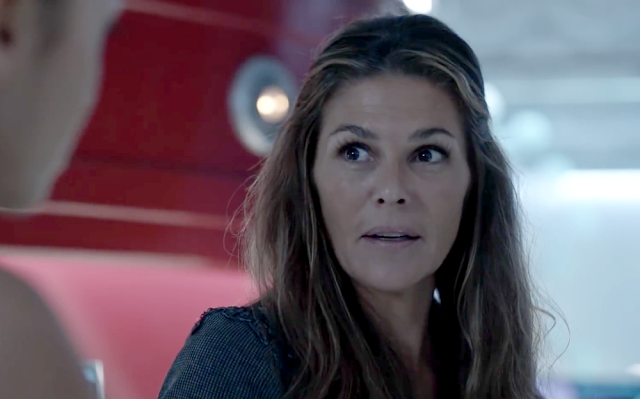 M - Abby is seen saying, "First we survive then we find our humanity again," before leaving on a boat with other Skaikru members. M - Monty and Harper are still together. "We'll find a way out of this." "Every time we think that, something bad happens." M - "Don't you want us to survive," Clarke asks Jasper. "No, I don't want us to survive, I want us to live." It's great to see Jasper finally healing and finding joy in life. While everyone fights to survive, he just wants to live. K - I've seen some people who believe the writers are just going to ruin Jasper's character this season, but I don't see that at all. I think underneath the smile on Jasper's face there is still a lot of pain, but he's trying to make the best out of what has become his life now. I'm excited to see where this mindset leads him this season. He's definitely thinking hey, if we only have so many months left on Earth why are we trying to survive the inevitable? Why not just live? And I'm sure there will be others who feel the same way as he does. M - Octavia is seen badly injured. K - Okay, before we see Octavia, we saw a young woman placing what looked to be "Lexa" plus the other commanders (inside the chip), on her forehead.. So what could this possibly mean? What is she doing? Why does she have that? So many questions! K - There are so many shots we get as the trailer comes to a close; we once again see Bellamy pointing his gun at someone, Octavia fighting with war paint on her face, and Raven having a possible seizure? 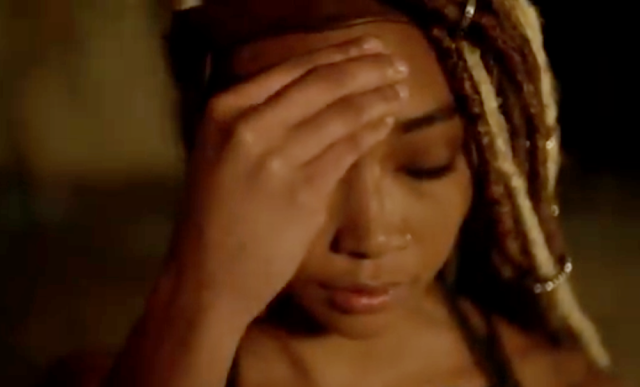 M - Indra's fate was left unknown at the end of last season but now we know she's still alive after we see them getting her off the cross she was left hanging on. Murphy and Emori are still together. Kane and Abby share a moment. K - It all ends with Emori telling Murphy, "survive, please." 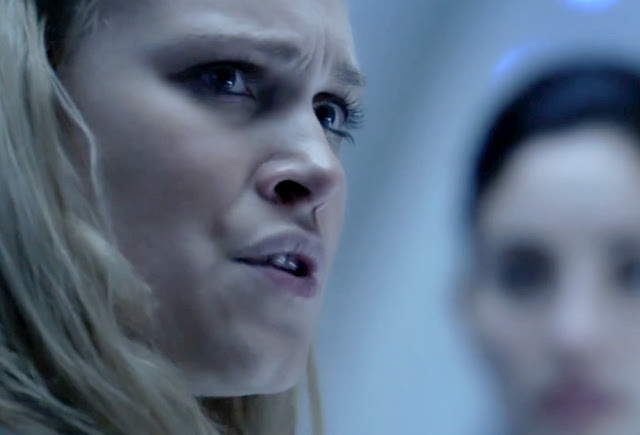 M - Most of all in the last final seconds of the trailer, Clarke is shown suffering the effects of the radiation. Is Clarke going to be one ill-fated or could this just be someone's nightmare? K - Or could Clarke be infecting herself in order to find a cure? You know, that would be something she would do! M - This may be the toughest challenge and fight for survival the 100 and Sky People have yet to face. Will they survive? Can they survive? There's no telling what this season may hold. K - From the looks of this trailer, this season will not disappoint. I'm so excited for The 100 to be back on our screens this February, even though I already know that I will regret ever saying how excited I was when it completely breaks me by the end of the season. Who will survive? How will they survive what we know is sure to come? This almost seems impossible, but if we have learned anything from these characters it's that they are strong together and they can beat the odds, so I say bring it!! M - "From the ashes. We will rise." M - What do you think will happen this season? Did you spot something in the trailer? You can watch all three seasons of The 100 on Netflix now! Remember to tune in every Wednesday starting February 1 at 9/8c, to watch The 100 live on the CW.